You may have heard of the lunar nodes and specifically the North and the South nodes. These aren’t planets which travel across the zodiac but rather they are mathematical points calculated by where the moon’s orbit cuts the ecliptic (which is the path the Sun takes around Earth). The lunar nodes are in pairs, in opposing signs of the zodiac which change position approximately every year and a half or so and during their time in a certain set of signs we will experience eclipses in this set of opposing zodiac signs. As you probably know by now, Soulstrology teaches us that when there are eclipses in a certain set of signs, it offers each of us (regardless of our zodiac sign) the opportunity to create very big lasting changes in the areas of our charts/lives that the nodes/eclipses are triggering. If the nodes/eclipses are taking place in our Sun or Rising signs, we can expect even more significant shifts to take place! But back to the here and now…a month ago, on November 15, the lunar nodes switched position out of the Leo/Aquarius axis and into the Cancer/Capricorn axis. This is big news for all of us because as I am sure you know both cosmic power players Pluto and Saturn are dancing around in Capricorn…and now they will be joined by eclipses in the Cancer/Capricorn axis. So what does this mean for all of us in practical terms? First off we must remember what Soulstrology teaches about the lunar nodes and the role they play in our lives. The South node (which is now in Capricorn) is all about the past. Generally speaking the South node represents what comes easily to us, what is comfortable, what we are used to doing because we have experienced it already in a previous lifetime. So this can mean what we are naturally good at which we don’t need to necessarily ‘try’ at. However on a less positive note, the South node can also represent unresolved karma and baggage from previous existences. This can be traits which we find hard to rid ourselves of, patterns we keep repeating which keep us stuck in a vicious cycle, certain mindsets/ideas/attachments/illusions. 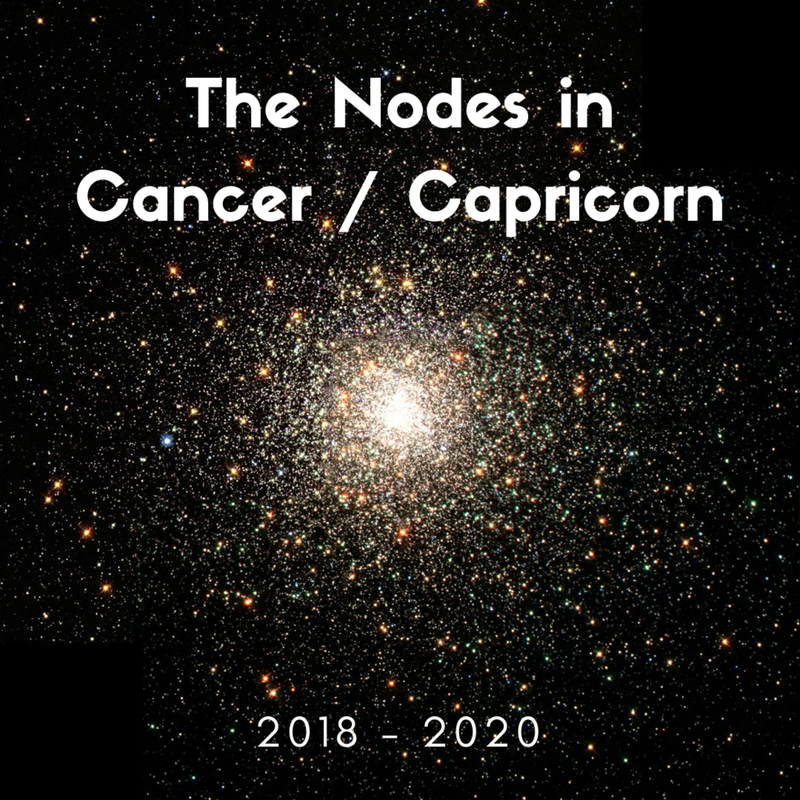 The North node (which is now in Cancer) is all about the future. It’s about our fate and destiny. What we are supposed to reach for in terms of consciousness and life experiences. It’s about character traits we are asked to adopt and themes of life we are asked to integrate into our present lives. It doesn’t necessarily come easily to us but if we can do it we can step into a new chapter of life which helps us fulfill our destiny. Now with the South node in Capricorn a lot of us will be experiencing some karmic lessons with regards to the Capricorn ruled parts of each of our charts. This is exacerbated because both Saturn and Pluto are also in Capricorn. As you all know, Saturn is a teacher to each of us, but can be a stern teacher who puts fear into us, and can make us feel as though we are delayed in getting what we desire (he rules time and loves to take his good ole time to teach us a lesson!). Currently he is teaching us many lessons in the Capricorn ruled parts of each of our lives alongside powerful Pluto who since 2008 has been transforming the Capricorn ruled parts of each of our lives but is now having his efforts ramped up by having Saturn’s assistance. Important note for your diaries now…in 2019 Saturn meets up with this South node in Capricorn three times - May 20, June 23 and September 25. Events around these times will have a distinctly karmic feel to them and may be challenging but are also amazing opportunities for us to step into the North node of Cancer…which leads me nicely onto my next point! Over the next 18 months we may experience tests and challenging times in the Capricorn ruled parts of each of our charts (hey we may already have done in the last year of Saturn in Capricorn!) but that doesn’t mean that we will be forever stuck with regards to these areas of life. Rather, what it means is that when faced with the challenges in the Capricorn ruled parts of our charts and lives, we need to step away from the qualities, traits, ways of being and doing which come naturally to us in these areas of life and step into the opposing realm of Cancer. Capricorn plans, schedules, organizes and climbs the mountain focusing on facts and figures. Capricorn sees everything in black and white, relying on logic and rational - mind over matter. This can serve us well in many ways. But this often comes at the expense of emotions and intuition and indeed the right brained thinking. The latter is the realm of Cancer. Cancer emotes their way through life (yes, perhaps sometimes too much but that’s for another time!). They use their intuition and feelings to guide them through life. They express their emotions, feel all the feels and by processing their emotions, they navigate the trials and tribulations of life. They trust their intuition over logic and facts. Their hearts rules their heads. Over the next 18 months each of us are asked to be more like Cancer. Rather than to hustle and rationalize our way through life e.g. “If I do this, I will get this”, we are asked to nurture ourselves (Cancer is the sign of the mother, family and home), let our hearts guide us, feel our emotions, and allow ourselves to be the living, feeling humans that we are. Over the next 18 months if and when we face difficulties in the Capricorn ruled parts of our lives if we can step into the Cancer traits rather than trying to solve, or fix a la Capricorn, we may find that we experience a lot more ease and flow and problems miraculously solve themselves! Note, with Saturn and Pluto in Capricorn this doesn’t mean that we won’t be doing the Saturn esque ‘work’ in the Capricorn ruled parts of our lives and charts, but what it does mean is that when we feel we are slipping into rigid, fixed ways of being, or are focusing too much on ‘facts’ and not relying on our feelings/intuition, we know it is a sign that we need to stop and drop. What do I need to do to nurture myself so this area of my life can be nurtured and can flourish? What do I need to allow myself to feel and heal? How can I tap more into my intuition and let it guide me as to what next to do in this area of life? How can I be more loving and soft in this area of life? How can I learn to ebb and flow more with regards to these matters of life? Catching a wave and riding with it, rather than swimming against the currents? There will be more to come on this topic in time to come but for now check out the Soulstrology zodiac guides below for the Nodes in Cancer/Capricorn and maybe journal on the life areas being brought into the cosmic spotlight and how you can infuse those Cancerian traits, qualities and themes into life. Have a wonderful weekend and I will be back next week with your Winter Solstice/Full Moon in Cancer posts. Capricorn/Capricorn rising: partnerships and close relationships of all sorts - romantic, platonic and professional.